But what if you could download the subtitles from your VLC player itself? There are many other players that lets you do this, but VLC doesn’t have this function natively. But VLC allows you to install extensions, that can give you added functionality. 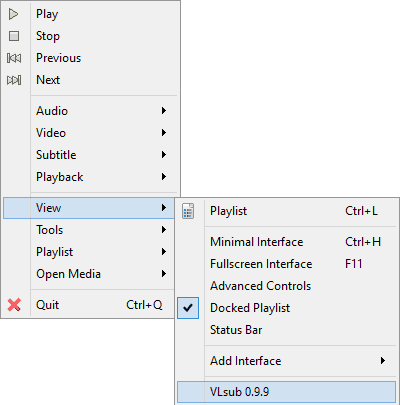 An extension called vlsub can be installed in VLC which will then allow you to download subtitles for the current playing video. Not only this, it will automatically load the subtitles so that you can see if the subtitles are in sync with the video, if not, you can download other one from the search results. This is not as simple as installing any other program. You need to download the vlsub extension and paste it to the extensions folder in VLC. Below is the complete process. Go to this website and download the “vlsub” extension. You need to press the big “Download ZIP” button on the right sidebar. Then extract the archive you downloaded with some application like WinRAR. Now copy the “vlsub.lua” file and paste it in the “extensions” folder of your VLC installation. The extensions directory depends on your operating system. NOTE If the extensions folder is not present, then you can create an empty folder and paste the “vlsub.lua” file in it. After pasting the extension open the VLC Media Player. Now play any video file you want to download subtitles of, and right-click the main interface. Now select “View > VLSub” and a new windows will pop-up. The extension will automatically fetch the name of the file which is currently playing. Now you can search for the subtitles in two ways. Search by name: This will search for the subtitles according to the name of the file. This will result in more number of search results and you may have to download and try many files before you get the right subtitles files which is in sync with your video. Search by hash: This will give you lesser number of search results and chances are that most of them will be in sync with you video. TIP First perform a search by hash, if you get some results, try them. If no result is in sync (chances are very less though) with your video then perform a search by name. Once your subtitle gets downloaded, it will be automatically be loaded with the current video. If the file is in sync then you can continue the video, else you can search for more subtitles. You can even enter the series and the episode number if you are searching for subtitles of TV shows. Awesome extension, thank you for this information.